It’s been a while since I took to the blog to praise an awesome governor; Chris Christie got this treatment a while back, I know. Heck, it’s been a while since I noted how awesome Paul Ryan is. I’m way behind. That being said, Scott Walker is awesome and Wisconsin is lucky to have him in the Governorship. If only every state had a governor with half the courage of Walker to take on the fiscal problems they face, this country would be in much better shape. May God bless our nation with a wave of Chris Christies and Scott Walkers. Walker is, of course, the subject of a recall election in Wisconsin these days, which would be hilarious if it weren’t such a waste of time and resources. Allegedly the recall is happening because Walker’s policies – specifically his collective bargaining reforms – are so damaging to the state. The reality is that public sector unions are pissed off at Walker for making it harder for them to collect their dues, among other things. Why would I say such a thing? Because a mere 6 days before the election, Walker’s opponent still can’t name one Wisconsin school district that has been harmed by Walker’s reforms. “We can do an analysis and get back to you on that” is the best he can do. Politics is ridiculous in 2012. Please, Wisconsin – don’t make it stupider. 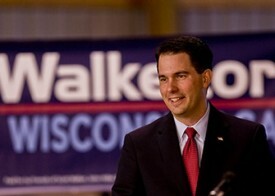 Keep Governor Walker right where he is.